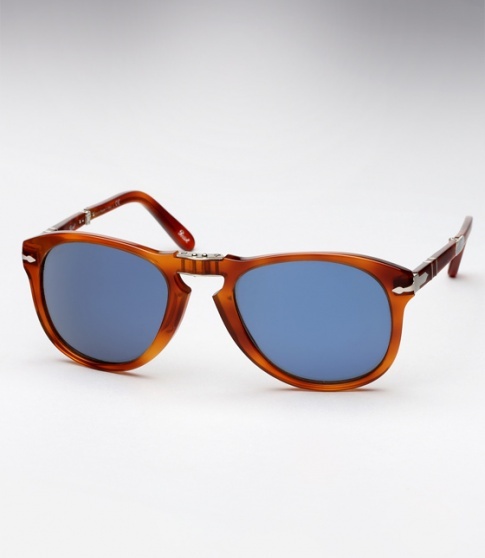 Persol 714SM - Honey Tortoise w/ Blue Need Help? Worn by McQueen both off screen and on, in movies such as “The Getaway” and most notably “The Thomas Crown Affair” where he unforgettably sported a pair of 714’s with lenses he had custom tinted blue (be sure to ask us about our custom lens work). To pay tribute to the 714’s history and the man who cemented its legacy, Persol has released a very limited Steve McQueen edition of the timeless frame, the “714SM”. There are a couple key and cool distinctions between the 714 and the limited 714SM, including: inward folding hinges which showcase the signature Persol double arrow, as it was originally in the 1960’s and on the pair McQueen wore. As well as a premium Italian leather pouch which easily slips into a coat pocket. It is offered here in Honey Tortoise which is complimented by Persol's modernized blue glass lenses coated with a flash mirror. Special edition premium brown leather Persol case.